The title probably scared off any readers who are fearful of overwhelming Christian messages. Or those who are tired of the sappy, happy greetings. I wanted to do something a little different. I want to share something personal and important with you. Something that could change your life. Or at least improve your enjoyment of this sugary holiday. 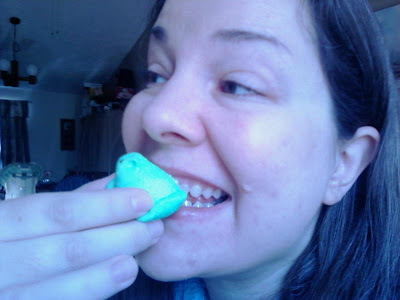 How to eat a Peep Doesn't matter if you like Peeps or not. How to eat them is an important life skill. There is the nibble the side method... Bite off the head and then work your way down the body... Or stuff it all in your mouth at once! You forgot the puff it all up in the microwave method! And no matter the method, make sure it's just a little bit stale! Personally, I think "STUFF" is the way to go. And my hips bear witness! 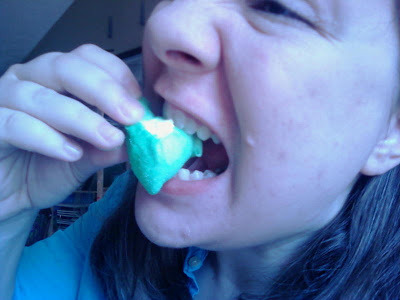 Peeps are a national treasure no matter how you eat 'em. Enjoy and Happy Easter to everyone in Lizdom. I had it on the list to blow one up for this post... but had to cancel it because we had to hit the road to Ohio for Easter with my family! Yuck, no peeps here. But, I love watching them blow up in the microwave! You need to take the peeps out of the package and let them sit out overnight to get stale. It's the very best way to eat peeps! Not to worry Joanie... I ate a stale one (pack- haha) when we got home and after we got the kids to bed. The sat out all day! Delish! PS: Did I mention you are a complete dork? My dorkness is what makes me so darn loveable!!! Yeah.... dork.... I like them frozen. Frozen?? I've never done that!! GOod thing Peeps are on clearance these days! LOL! A Fun Video You Simply Must See!! I Hardly Know What To Do With Myself! Looking for Someone to Love and Help? Have You Got The Cajones? I'm Here to Pump *Clap* You Up! You Want Him To Write a Song About Me!